Episode #328 Part I: Superman Comic Book Cover Dated April 1964: Superman 168! Download Episode 328 Part I! SUPERMAN 168, April 1964, was published around February 6, 1964. It contained 32 pages for the cover price of 12¢. 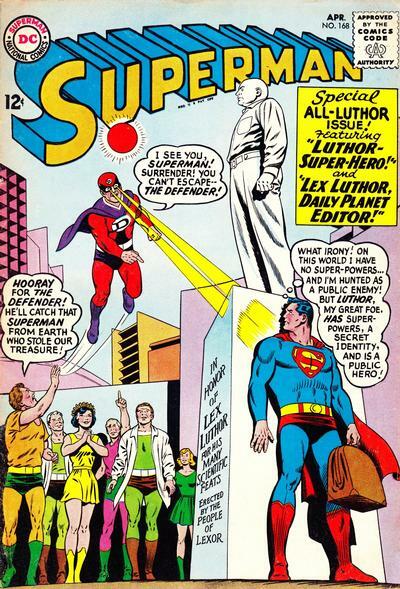 Mort Weisinger was the editor, and the cover was pencilled by Curt Swan and inked by George Klein, who were the art team for the story in this issue. This story has not been reprinted. - LUTHOR -- SUPER-HERO (25 pgs. ), had two writers. Part I (12 pgs.) was written by Edmond Hamilton. Part II (13 pgs. ), was not titled, but the Grand Comic Book Database calls this second part LEX LUTHOR, DAILY PLANET EDITOR, which was written by Leo Dorfman. Also covered in this episode are the issue's ads and other features, including a very special METROPOLIS MAILBAG letter column, which was in honor of the late President John F. Kennedy, who was assassinated as this issue was about to be printed. The column mentioned the story,SUPERMAN'S MISSION FOR PRESIDENT KENNEDY. This latter story would be printed in SUPERMAN 170, which was covered way back in Episode 49. Mark Evanier wrote this column at his website http://www.newsfromme.com/ about the history of this story. Next Episode: SUPERMAN COMIC BOOK COVER DATED APRIL 1964 PART II: ACTION COMICS 311! Then we will feature: THE SUPERMAN FAMILY COMIC BOOKS COVER DATED JUNE 1961: PART I: SUPERMAN'S PAL JIMMY OLSEN 53 & PART II: WORLD'S FINEST COMICS 118! After that, we will return to: THE SUPERMAN COMIC BOOKS COVER DATED MAY 1964: PART I: SUPERMAN 169 & PART II: ACTION COMICS 312! Episode #327 Part II: Superman Family Comic Book Cover Dated May 1961: Superman's Girl Friend Lois Lane #25! Superman's Girl Friend Lois Lane 25, May 1961! Download Episode 327 Part II! SUPERMAN'S GIRL FRIEND LOIS LANE 25, May 1961, was published on March 23, 1961. It contained 32 pages, STILL for the cover price of a dime. The editor was Mort Weisinger, and the cover was drawn by Kurt Schaffenberger. It featured the issue's first story. All three stories have been reprinted in SHOWCASE PRESENTS: SUPERMAN FAMILY vol. IV. - LOIS LANE AND SUPERMAN, NEWLYWEDS (9 pages), written by Jerry Siegel, according to the Grand Comic Book Database, while Mike's Amazing World Of DC Comics and the Comic Book Database list the writer as unknown. This was Siegel's 60th silver age Superman Family story, and his 102nd overall covered in this podcast so far. The artist was Kurt Schaffenberger. - LOIS LANE'S DARKEST SECRET (8 pgs. ), was written by Robert Bernstein, according to the Grand Comic Book Database. Mike's Amazing World Of DC Comics and the Comic Book Database list the writer as unknown. Kurt Schaffenberger was the artist. - THE THREE LIVES OF LOIS LANE (9 pgs. ), writer unknown, was drawn by John Forte. The episode begins with MY PULL LIST review of the August 2015 comic books I received from the Discount Comic Book Service. Elsewhere in DC Comics, 28 titles carried the may or May/June 1961 cover date, according to Mike's Amazing World Of Comics. Next episodes will feature: SUPERMAN COMIC BOOKS COVER DATED APRIL 1964: PART I: SUPERMAN 168 & PART II: ACTION COMICS 311! Then we will return to: SUPERMAN FAMILY COMIC BOOKS COVER DATED JUNE 1961: PART I: SUPERMAN'S PAL JIMMY OLSEN 53 & PART II: WORLD'S FINEST COMICS 118! Episode 327 Part I: Superman Family Comic Book Cover Dated May 1961: World's Finest Comics #117! World's Finest Comics 117, May 1961! Download Episode 327 Part I! WORLD'S FINEST COMICS 117, May 1961, was published around March 2, 1961. It contained 32 pages, STILL for the cover price of only 10¢. Jack Schiff was the editor, and the cover was pencilled by Curt Swan and inked by Stan Kaye, who were the art team for the Superman/Batman story in this issue. - THE SUPER-BATWOMAN AND THE SUPER-CREATURE (13 pgs. 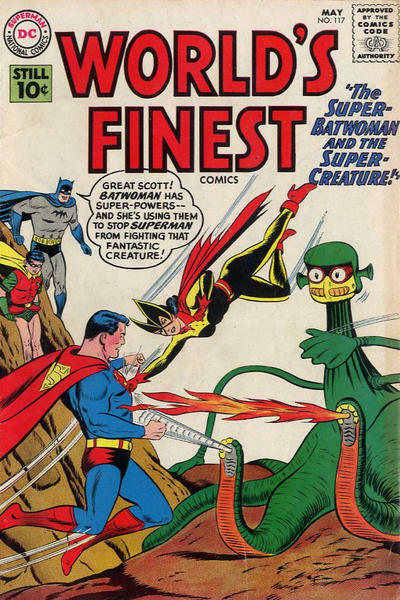 ), was written by Jerry Coleman and was reprinted in SHOWCASE PRESENTS: WORLD'S FINEST vol. II. - Tommy Tomorrow starred in the seven page story titled, THE DEVIL'S ISLAND OF SPACE, drawn by Jim Mooney. - Green Arrow and Speedy starred in the six page story titled, THE CARTOON ARCHER, written by Dave Wood and drawn by Lee Elias. This story has been reprinted in SHOWCASE PRESENTS: GREEN ARROW vol. I. 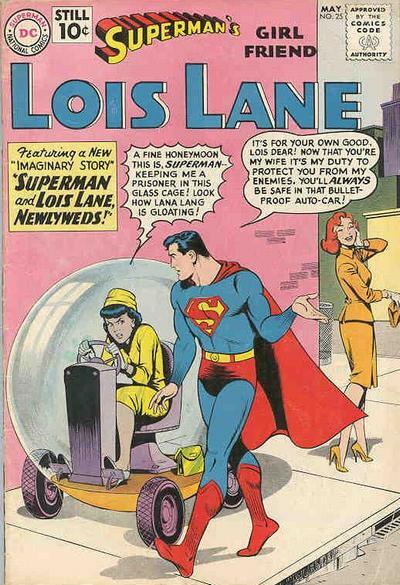 Next Episode: SUPERMAN FAMILY COMIC BOOK COVER DATED MAY 1961 PART II: SUPERMAN'S GIRL FRIEND LOIS LANE 25! Then we will feature: SUPERMAN COMIC BOOKS COVER DATED APRIL 1964: PART I: SUPERMAN 168 & PART II: ACTION COMICS 311! We return to the Superman Family titles with: SUPERMAN FAMILY COMIC BOOKS COVER DATED JUNE 1961: PART I: SUPERMAN'S PAL JIMMY OLSEN 53 & PART II: WORLD'S FINEST COMICS 118!